Designing a heating system for a sports hall can be challenging. The main issue is usually the effect of a very high ceiling, often in excess of 6m. In tall buildings conventional convection based heating systems can be very expensive to run. It is estimated that in a conventionally heated building, the air temperature will increase by around 2.5°C for every metre above floor level. Therefore, to maintain an air temperature of 20°C at floor level, in a 6m high sports hall, the air temperature at ceiling level would be around 35°C. The net result is a large body of over-heated air that is expensive to generate and serves no useful purpose. The second challenge when designing a sports hall heating system concerns the sporting activities themselves. Heaters mounted at low level can interfere with activities and even be dangerous. This means that heaters mounted at high level tend to be more acceptable but, of course, maintenance of high level equipment is difficult and expensive so heaters that require little or no maintenance are preferred. Even with a high mounting position, occasional impact from a stray football or tennis ball is inevitable so any heater needs to be robust enough to cope. Many sports hall are used for activities other than purely sports. School halls for example are often used for parents’ evenings, exams etc. Where this is likely to apply, a silent system is generally preferred. Where a sports hall is used continuously for a good few hours each day, BN Thermic usually recommends a heating system using radiant cassettes which are generally suspended from the ceiling in an evenly distributed grid. 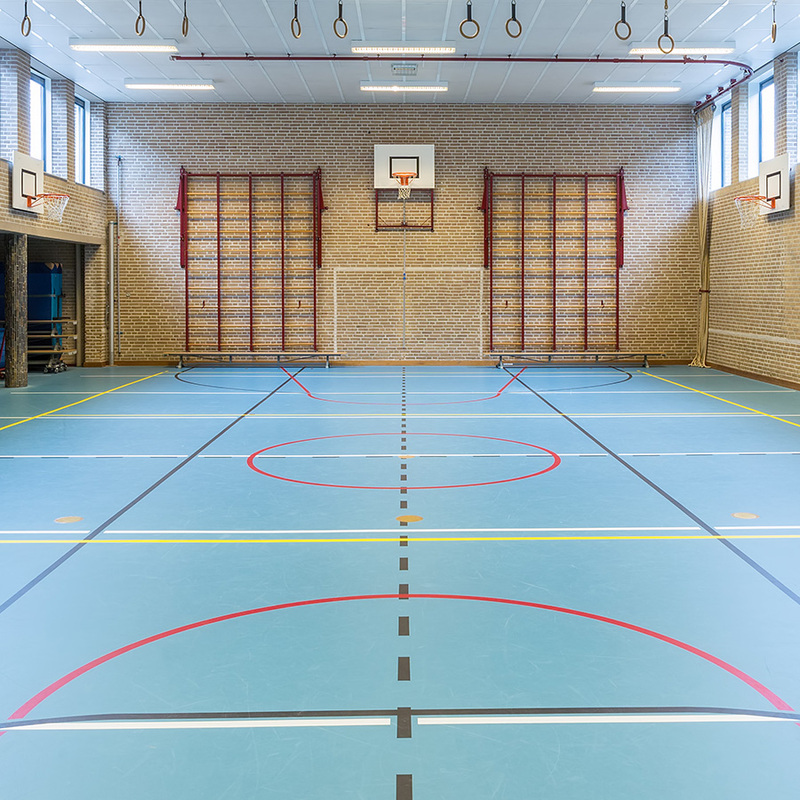 Radiant cassettes are particularly well-suited to sports hall heating because they do not give rise to a significant temperature gradient meaning that the air temperature at high level is virtually the same as it is at floor level. The resultant saving in energy consumption speaks for itself. Heating a sports hall, even with radiant cassettes, can be prohibitively expensive when the facility is only used intermittently. 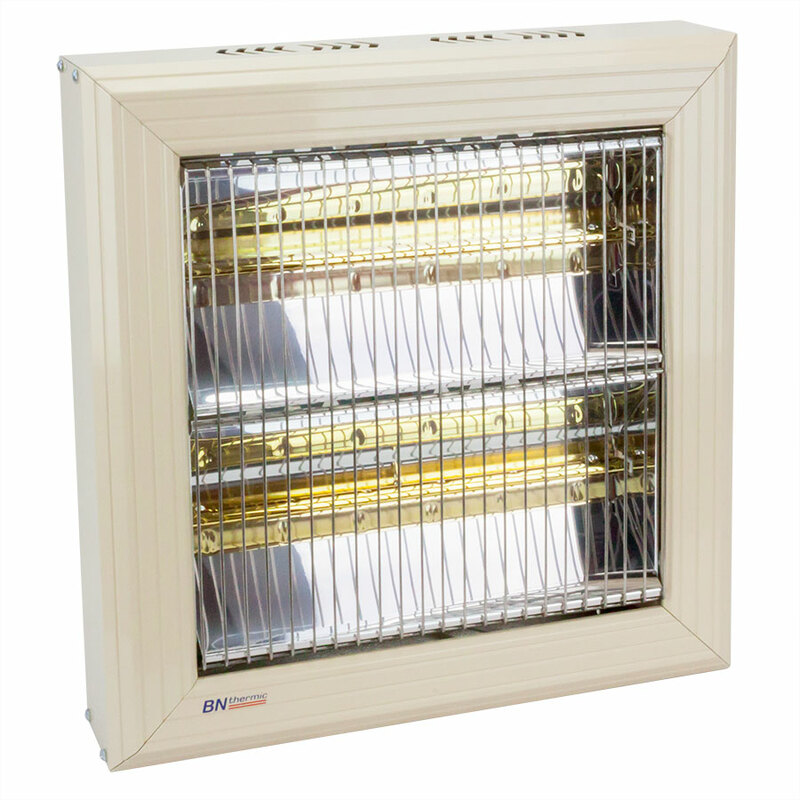 In these circumstances halogen heaters are sometimes preferred because they are instantly effective and therefore no pre-heating is required. Halogen heaters are generally mounted between 3m and 5m above floor level, and emit shortwave energy which is absorbed by solid bodies including the floor, equipment and, of course, people. Because halogen heaters operate in the shortwave part of the spectrum, some light output is inevitable. However the introduction of BN Thermic’s Magic Lamp reduces the light intensity to a barely discernible glow. Halogen heaters can be suspended from the ceiling or wall-mounted and are often controlled by energy saving devices such as movement sensors or time switches. It should be noted that halogen heaters use glass halogen lamps making less resistant to mechanical damage than radiant cassettes. Sports Hall heating systems, whether using radiant cassettes or halogen heaters, need to be carefully designed. The engineers at BN Thermic are very experienced and are always on hand to assist. When required, they will visit a sports hall, carry out a survey and provide a bespoke heating proposal. There is a never a charge for this service.